Jim Kimmons is a real estate broker who has found website success with Diverse Solutions. Jim didn’t want to keep his success a secret and decided to write a series to share his story with other real estate professionals. In Part 1 of Jim’s series he shared how the basic dsIDXPress IDX plugin improved his SEO and grew his sites traffic. In Part 2 of the series, Jim explains how the Pro version of dsIDXPress can convert your sites visitor into a lead via its forced registration capability. Grow traffic through relevant content and good SEO practices. Use IDX Search as a tool for visitor satisfaction, but also for SEO, Search Engine Optimization. The dsIDXPress plugin for WordPress creates a unique webpage for every listing in your MLS. As I showed you in the previous post, you’ll begin to get visitors using address and MLS number searches, as all of these great keywords and phrases are part of the hosted data on your site. Now that we have that visitor, what’s next? My third requirement for a successful real estate website is crucial, as there will be few commissions generated by a site that doesn’t provide me with the contact information for prospects searching my IDX solution. That must happen, but optimal lead generation still requires one more important capability: enhance the search experience for the visitor so they return over and over until they’re ready for a buy or sell transaction. The image shows how the dsIDXPress Pro plugin for WordPress allows us to set up criteria for if and when we will force our visitor to register to search the site. 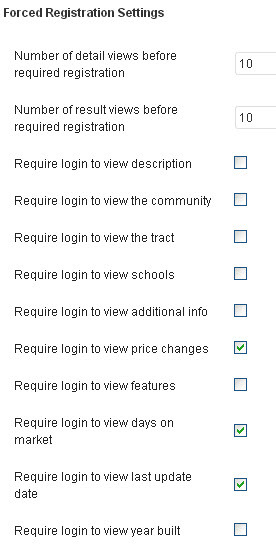 The top two items allow you to enter the number of views before they must register. Letting the visitor view multiple search and listing detail views will give them time to like the features of your site search and they’ll be far more likely to register to continue. For this reason, you might want to experiment with the number of views, but too few could reduce your registrations. If you want, you can place those numbers at very high levels and use one or more of the other criteria to force registration. Being too restrictive could reduce registrations, so choose carefully and run some tests. One possible approach might be giving them a high number of views, but getting the registration when they want to see certain valuable data items like those checked in this example. What does this registration mean to the dsIDXPress Pro plugin user? At this level, you are informed of their name and email address via email when they register, and you can place them into any contact management or email marketing system you desire. Contact forms are also included in this product. It’s an economical solution and will bring you qualified leads. Whether you’ve gently nudged that visitor with your forced registration options above or not, there are other ways in which you can enhance their experience and entice them to register. With the dsIDXPress Pro plugin, they are offered the ability to save their favorite searches, use listing RSS feeds, save favorite listings, and get listing alerts via email. 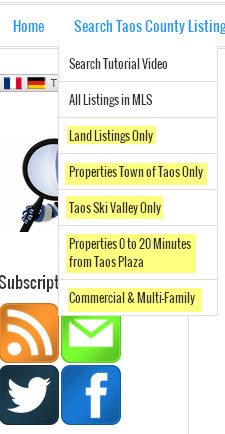 In the image you can see drop-down navigation search options on my site. The highlighted options are links to my pre-filtered searches. I set up the criteria and the plugin gives me a URL for the search results. All I have to do is to use the default WordPress Menu function to set up these searches. My visitors can get to their specific interests quickly. In your market, these could be waterfront, neighborhoods, subdivisions, property types (condos), price ranges, or just about any criteria you want. Another great use for this feature is the ability to use those results URLs in posts and pages as well. Let’s say that you’re publishing a page all about the loft district in your market. Simply create the pre-filtered search and use the URL as a text link on that page, or as a button. Everything you do to speed and smooth the search function for your visitors adds value to their experience and builds good will. They will come back to your site again and again, and you’re far more likely to end up with a customer or client. In the next post I’ll show you another awesome tool from Diverse Solutions and how it works on my site; dsSearchAgent IDX Map Search.